Electronic Arts has worked hard to transform its gaming business for the modern age. Games like Command & Conquer Generals 2 that would have been boxed retail releases a decade ago have been recast as free-to-play online titles. Game studios like PopCap, whose titles Bejeweled and Plants vs. Zombies are staples of the mobile and casual markets, were acquired for an estimated $1.3 billion. Efforts to future proof the game company while also returning to the earning power of the company prior to the 2008 market crash have been only been partially successful for Electronic Arts. Digital revenue is up according to EA’s earnings report for the holiday quarter, but console game sales are declining far faster than EA’s newer businesses can grow. EA reported adjusted revenue for the holiday quarter at just under $1.2 billion, with a loss of $45 million. This is well below expected revenue of around $1.3 billion. As stated, Electronic Arts’ digital business grew 17 percent year-on-year thanks to games like the mobile game, The Simpsons: Tapped Out, which generated $23 million in net revenue all in its own. The console game business though, remains the greatest source of income for Electronic Arts, and its console business drowned over the holiday quarter. While packaged games brought EA $738 million during the holiday quarter in 2011, those sales fell 23 percent to $568 million during that period in 2012. The problem is that EA’s console game tent poles, namely FIFA and Madden NFL, aren’t supported by strong action titles any longer. FIFA 13 sold 12 million copies across all platforms, a 23 percent increase over FIFA 12 during that time last year. Its success was negated by the abject failure of Medal of Honor: Warfighter. “Medal of Honor: Warfighter didn’t deliver, and we underestimated the overall softness of the console goods sector,” said CEO John Riccitiello during EA’s conference call. The timing is especially interesting. 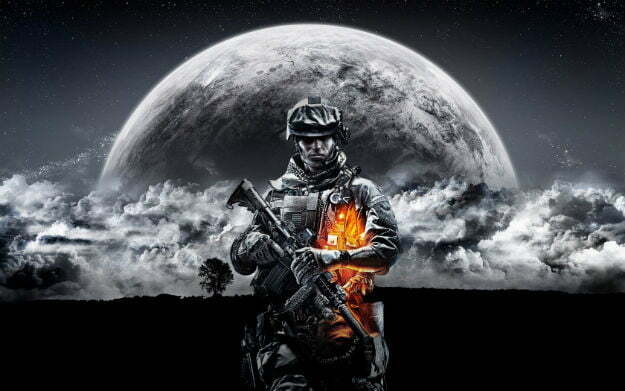 Battlefield 3 was revealed at GDC in 2011, and Medal of Honor: Warfighter was officially unveiled at GDC 2012. With GDC 2013 happening March 25-29, it would make sense for EA to once again dominate the show with a major announcement, but 90 days would put the unveiling date in late April or early May, falling in the no mans land between GDC and E3. With EA annually releasing its shooters in October or November, that could put the release well into the suspected launch window of the next Xbox and possibly the next PlayStation. Could that mean the Battlefield announcement will be after, or perhaps even in conjunction with the unveiling of a new console? That is supposition, of course, but it is logical.